The speed of Internet access does matter for some people especially those in the competitive industries where time and connectivity is of essence. Many people are willing to pay a higher price in order to get a speedy Internet connection. If you pay through your nose every month but still feel the connection provided by your Internet service provider is too slow, probably it’s time to check your Internet connection speed. 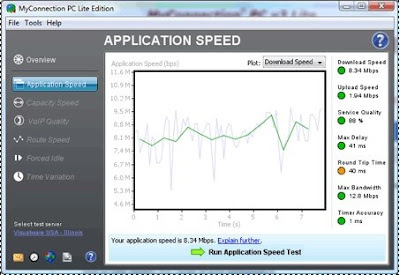 If you do not like to use online speed test sites to measure your Internet speed, MyConnection PC Lite is an effective internet connection speed test app to get the job done. the test result in easy-to-understand and graphical chart formats. It tests the internet connection, analyzes the download/upload consistency and checks the connection quality. The report displays the actual flow of data transfers during a connection test to help identify the cause of poor performance besides furnishing users with key information to identify and resolve connection problems.